Thank you so much to Samantha for returning to write more for us, Samantha has shared with us in the past, check out Cookies Keep Me Sober or Pickled by Alcohol. I found my way into the rooms of AA through my Higher Power and a series of fortunate events that are more spiritual than they could ever, ever be fate. I do believe there are angels among us. I believe that a Higher Power presents us with opportunities as we approach a bottom in an effort to save us. After quickly evolving into a full-blown alcoholic and having an almost hit bottom experience, I entered treatment. Treatment wasn’t for me. My presence in treatment was to save face. 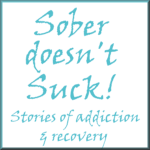 Treatment was for my boyfriend, my family and anyone that made any indication I had a “problem” with alcohol. In treatment I developed relationships with women and came to the understanding that this “ism” this disease, I did not believe was a disease, was not in fact the source of the issue. The source of the issue was so many other things, it was that ism. Everyone in the room around me had this ism. It was self-hatred, anger, ego, pride – all of the character defects we are so familiar. I built a foundation during this time. I understood my ism. But, I never admitted defeat or powerlessness. I was only abusing alcohol. I was not defeated. I was not powerless over anything and I did not need any restoration toward sanity. And so the cycle of spiraling toward bottom continued. No one at my workplace had any idea I went home nightly and drank shot after shot after shot of alcohol. I came to work daily, performed my job function and hopped in my car at the end of the day with a fresh roadie for the trip home. Yet, strangely enough, in one rare moment of perhaps acceptance, I mentioned to someone, at my office that I might have a problem. This person happened to be in the program. This person is one of those angels I believe our Higher Power sends to help us; if we ask for help. For the next year my friend, my co-worker listened as I denied any consequence I suffered being a direct result of alcohol. She listened every time. And that is the key – she listened. She never really promoted AA. She lived it. She practiced the principles in her affairs and attracted me to the point I wanted something she had. I wanted something that I had not experienced. I wanted serenity. I wanted peace. I wanted those promises I had not really read to be real for me. After this year she somehow sensed I was ready. She gave me a list of meetings and asked that I attend one. So I did. I attended the meeting that day. She sent her sponsee to meet me in hopes that I might ask this woman to sponsor me. I entered the meeting late. I noticed a woman who spoke as the secretary and asked her to sponsor me right away. And so, we began to work the steps. My ego would love to say that was the end of the story and everyone lived happily ever after. That is not the case. My story, my lead, wasn’t done and wouldn’t be done for a few more years. I hit yet another “bottom” a few months later and my good friend, my angel from work stepped in again. I was preparing to go on vacation for a week and she told me I had to attend meetings. No way! There was no way I was going to meetings on vacation. They likely didn’t even have any on this remote island. Most importantly, this was my vacation and my vacation didn’t include a meeting. My friend found a listing of meetings and women and their numbers for me to call when I arrived. I promised her I would go to at least one and call one of the women. I can assure you I had no plans of doing anything beyond the one meeting I committed to. We arrived at the island and that Sunday I went to the pool a few hours before the meeting. I was lying on the beach chair reading the Big Book as I hid it behind my array of celebrity magazines. There were two other ladies at the pool and I said “hi” and kept reading. I made sure to hide my Big Book because I was so embarrassed by my alcoholism. I called my “friend” in the South, my “friend” from the island and we planned to meet at 7:00 p.m. that night. I arrived to the meeting to find both women from the pool at the meeting. In fact,one of the women was my assigned contact person. She greeted me with a hug and I commitment to go to another meeting. I confessed I was reading the Big Book at the pool and she chuckled at my cover up. We met daily to go to meetings. In fact, the small town on the outskirts of the island had an official AA meeting-house. We had lunch everyday. There was even a meeting on the island. We fostered an amazing friendship. I had a spiritual experience on this trip. Somehow through daily meetings, the bond of another female alcoholic and the serenity of vacation to clear my thoughts, I had that experience I had heard so much about. After four years I still travel to the same vacation destination. I meet my friend, my angel, every year and we attend meetings together. We chat from time to time during the year but our special bond is reignited annually. I shared something with her that few people experience. As a result she is truly one of those friends whose friendship is not impacted by distance. From year to year it seems as if only days have passed since our last meeting. My spiritual fitness needs exercised daily. My Higher Power presents angels but I still have work to do. Much like the program itself I am given only twenty-four hours at a time. Yes, I have been blessed to have angels among me to help raise me from my bottom. My Higher Power has placed special people, the women mentioned above, my sponsors, other fellows and even a husband, into my life to help me do the next right thing. I am grateful for the intuition to recognize the special people. I am grateful I took the help they offered. And, every day, every single day, I am grateful for the one day of sobriety I can own. What a great story. The first time I went in the rooms, I remember thinking “I am nothing like these people.” About a week later I realized, I am exactly like these people and still am. It is so interesting, no matter where I go, what town I am in, there is always someone who is in the program. and also you’re great, because you’ve expressed your gratefulness to them. I am so happy for you! I truly know how hard it can be at times, since I personally tried so hard to help my first husband conquer it, but he could not. I’m so glad that you are finding the support you need. What an inspiring story! !